Elaine C Smith will play the role of ‘Miss Hannigan’ in a brand new production of the musical “ANNIE” when the show plays the King’s Theatre Glasgow (8 – 20 February 2016), His Majesty’s Theatre Aberdeen (9 – 14 May 2016) and Edinburgh Playhouse (16 – 21 May). Elaine C Smith is probably best known for her enduring portrayal of ‘Mary Nesbitt’ in ten series of the BBC hit sitcom “Rab C Nesbitt”. Her other TV credits include “City Lights”, her own television series and specials “Elaine”, Kay Mellor’s “The Syndicate” and the hugely successful “Burdz Eye View” for STV. 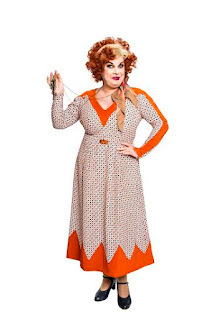 Her theatre credits include the Susan Boyle musical “I Dreamed a Dream”, which she co-wrote with Alan McHugh, “Calendar Girls”, ‘Miss Adelaide’ in “Guys and Dolls”, the title role in “Shirley Valentine and, for almost 20 years, Elaine has starred in Scotland’s leading pantomimes. Elaine C Smith joins Alex Bourne as ‘Oliver Warbucks’, Holly Dale Spencer as ‘Grace Farrell’, Jonny Fines as ‘Rooster’ and Djalenga Scott as ‘Lily’. The company also includes James Alan- Evans. Lewis Bradley, Nic Gibney, Sinead Kenny, Michael Lin, Alice Liveing, Megan Louch, Callum McArdle, Benjamin Mundy, Steven Oliver, Heather Scott-Martin, Anne Smith, Kate Somerset How. Sharing the title role of ‘Annie’ will be Madeleine Haynes, Isabella Pappas and Sophia Pettit. Joining them will be Asha Banks, Rosanna Beacock, Chloe Bowes, Connie Burgess, Claudia Carlier, Jessica Cartledge, Scarlet Churchhouse, Scarlett Flannery, Ashley Goldberg, Mia Hope, Amelia Love Coleman, Lissy Mant, Daisy Parry, Natasha Raphael, Nikoo Saeki, Liani Samuel, Kate Woodman and Tegan Williams.